Besides Buxtehude’s 14 trio sonatas in op.1 and op.2 there are six further instrumental sonatas. 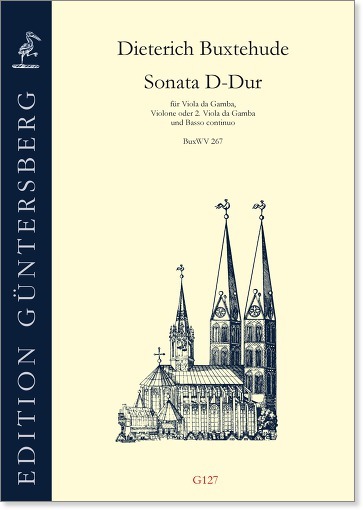 Among this group is also the present sonata with the unusual and unique instrumentation of viola da gamba, violone, and basso continuo. With “violone” an 8’ instrument was intended, i.e. its part should sound as notated, and not an octave lower. For this reason lacking a violone, the part could be played by a second viola da gamba or even by a cello. 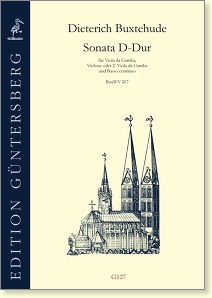 – Our edition consists of a score of the three original parts, three part booklets, and a separate score with a continuo realisation.